this is the most recent addition to my pinups that i bring to conventions with me. 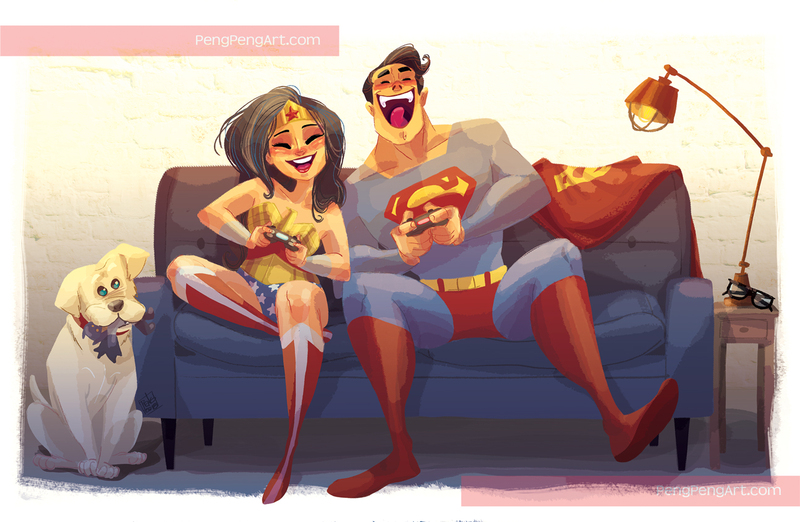 originally this was a commission for a client who wanted to see my version of Superman and Wonder Woman from when they were having a coffee break but now are just chillin playing video games together. i thought the idea was super neat and since my hubby and i play video games together all the time, i just immediately connected with the idea. the original commission has aKent Farm box full of Daily Planet newspapers in place of Krypto the Superdog. that version is exclusive to the commissioner and will never be sold to the public. i debuted the print at WonderCon this year and it has immediately been a greatest hits. =D i've listed a small handful of my etsy shop as well so if you're interested in getting one, head on over there (click the SHOP button up top). on a side note, i just wanted to give a huge THANK YOU to those of you that continue to check out my page. between all of the different social media platforms, plus Patreon, i haven't had much time to update this page as well. freelance life has always been a scheduling battle, even more so with social media. i'm definitely continuing to update this as often as i get a chance. this is still my online hub of all things Peng-Peng. so thank you for your patience and support! In the face of severe pollution of daily water supply and daily life of the people, they are affected by industrial emissions, factory waste, labor activities, daily production and agriculture. The quality of surface water and groundwater are affected by pollution which requires every family and business establishment to seek solutions to the problem of clean water, protect health and take initiative in everything. Operation work.